We had reviewed the Western Digital My Book Live in detail last October and came away impressed with the functionality and mobile app support in place for the cost. One of our chief complaints about the network attached unit was the absence of any sort of in-built backup measure to protect against a crashed hard drive. It was all the more puzzling, given the fact that the Applied Micro APM82181 NAS platform was more than capable of the usual NAS functions. 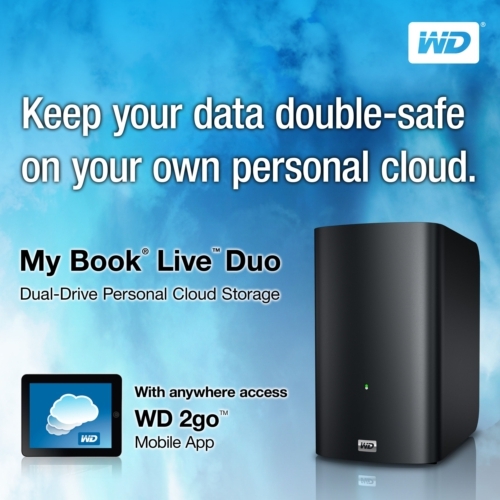 Today, Western Digital is expanding its My Book Live lineup with the introduction of the My Book Live Duo. Building on the industrial design of the My Book Live, the new unit accommodates two hard drives, and is capable of running them in either RAID-0 (higher capacity) or RAID-1 (mirrored for backup / availability). All the WD apps (WD2go on various platforms including the PC) for the My Book Live are available for the Duo version also. Western Digital confirmed that the Duo runs on the same platform as the My Book Live, i.e, a Debian Lenny build for the Applied Micro APM82181 PowerPC platform. The well-reviewed web interface and controls are retained. They also indicated that RAID-1 rebuild capability is available (so, if one of the drives fails, you can replace it with another drive and get RAID-1 protection back in place). The original My Book Live wasn't teardown friendly. Hopefully, the Duo version is better. Despite what Western Digital says with respect to RAID-1 (double-safe backup), I am sure readers understand that a RAID system is not a backup scheme, but just ensures data availability. That said, it is a good first level protection to have. Coming in 4TB and 6TB variants (priced at $399.99 and $499.99), the units appear a bit costly (more than double the cost of the equivalent My Book Live unit). Hopefully, as hard drive prices go down in the next few months, the prices will come down.